Back in March we raved about Casio's EX-F1, and it's just six months later and now Casio's got another super-fast frame rate camera for us: the EX-FH20. It's a smaller and lighter beast than its predecessor, but it has 9.1-megapixels, can still shoot ultra-high-speed bursts at 40 fps and high speed movies at "up to 1,000 fps" and has a 20x optical zoom, anti-shake, night-scene mode and standard 720p video option. It's intended to appeal to a broader bunch of users, rather than just camera enthusiasts, so it's a little simpler than the EX-1, with all the shooting modes on a single dial. It'll be available in black in stores from October for $600. Press release below. DOVER, NJ, SEPTEMBER 16, 2008 — Casio America, Inc., in conjunction with its parent company, Casio Computer Co., Ltd., Tokyo, Japan, today announced the release of its newest EXILIM® digital camera, the HIGH SPEED EXILIM EX-FH20. This remarkable new camera is capable of ultra high-speed burst shooting at 40 fps and can record high speed movies at up to 1,000 fps. In March of this year, Casio released the EXILIM Pro EX-F1, the world’s fastest digital camera*. The EX-F1 is capable of ultra-high speed burst shooting at 60 fps and can record high speed movies at up to 1,200 fps, helping users catch each decisive moment, and even capturing motion that the human eye cannot ordinarily perceive. These features have created a totally new genre of digital photography and won the respect and admiration of camera enthusiasts and professional photographers alike. 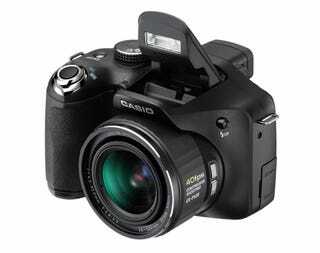 *As of September 16, 2008, based on a Casio survey for consumer market digital cameras. EX-FH20, Casio has launched the new HIGH SPEED EXILIM series, which includes this camera and the even faster EX-F1. Casio expects the revolutionary capabilities of its HIGH SPEED EXILIM cameras to generate entirely new applications for digital photography. The EX-FH20, MSRP $599.99, will be available in black at retail stores in October. The EX-FH20 is equipped with a 26 mm-equivalent wide angle zoom lens that can close in on subjects with a powerful 20X optical zoom. The camera also features a CMOS shift anti-shake function to support power-zoom shots. The EX-FH20 can capture action in high definition, 7 megapixel (3072 x 2304 pixel) images with ultra-high speed burst shooting at up to 40 fps. Users can select from seven burst settings, allowing them to capture from 1 fps up to 40 fps in a single burst. Further, users can prerecord up to 40 still images not just at the instant they press the shutter button, but before! Even if they press the shutter a little late, they will still catch that vital moment. The EX-FH20 can record high speed movie footage of motion too fast for the human eye, for ultra slow motion playback. Users can select from recording speeds of 1,000 fps, 420 fps or 210 fps and can also switch from the standard speed of 30 fps to high speed recording at 210 fps during recording at the touch of a button. The EX-FH20 makes it easy to capture critical moments on video. This function corrects images by automatically synthesizing multiple images captured during high speed burst shooting. With or without a tripod, this feature ensures that high speed night shots come out clear and beautiful. The EX-FH20’s HD Movie function records at 1280 x 720 pixels, at 30 fps.